Last week The Kid got his hair cut. Since I have been not-so-quietly complaining about my hair, today was my turn to trim my tresses. I’ve been through the long and short hairstyles all my life. When I was a little girl, kindergarten age, I wore a cute little pixie cut. I think my mother didn’t like to have to care for her children’s hair, the boys all used to sport crew cuts and I guess a pixie hairstyle was as close to a crew cut as a girl can get. But when I started taking care of my own hair, I opted to grow it long. By the time I was fifteen, it was well past my thighs and could easily sit on it. It was impossible to care for, especially a young teenager. When I had the opportunity to get it cut, I jumped at the chance. I got the requisite Dorothy Hamil wedge cut. Well about my collar… it was short! In fact, many people didn’t recognize me at school on the following day, it was quite fun to see the response. On and off over the years, I have grown it long and then been frustrated with the sheer volume of hair. In recent history, I have gotten my hair caught in the car door and in the window (trying to get the window up in the car when it was windy). I’ve gotten it in my food and my eyes and caught in zippers of jackets. I accidentally dipped it into open paint cans and almost caught it on fire. Enough was enough. So today was my turn with the haircut. 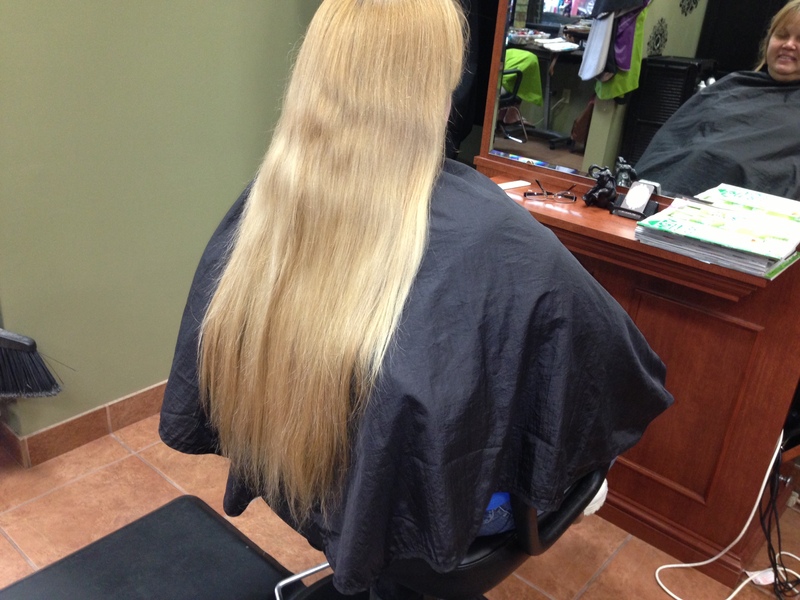 I had only two requirements: one, that it still be long enough to be put into a pony tail and two, that it was more than 10 inches so that I could donate to Locks of Love. The rest was in the hands of my trusty stylist. 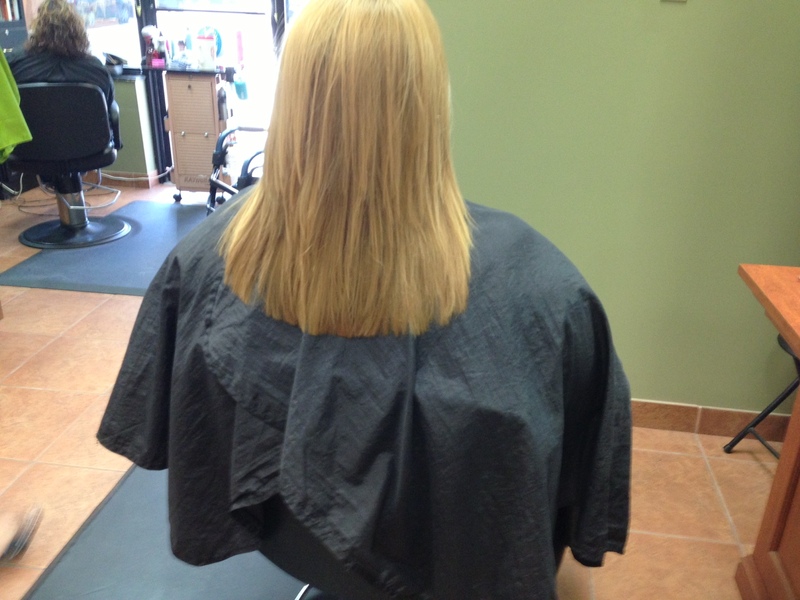 And here is the “After” photo. That was 14″ that came off! When the cut was made, I could feel the weight come off… it was an amazing feeling! I can’t wait to break out the curling iron and get some fun curls going! 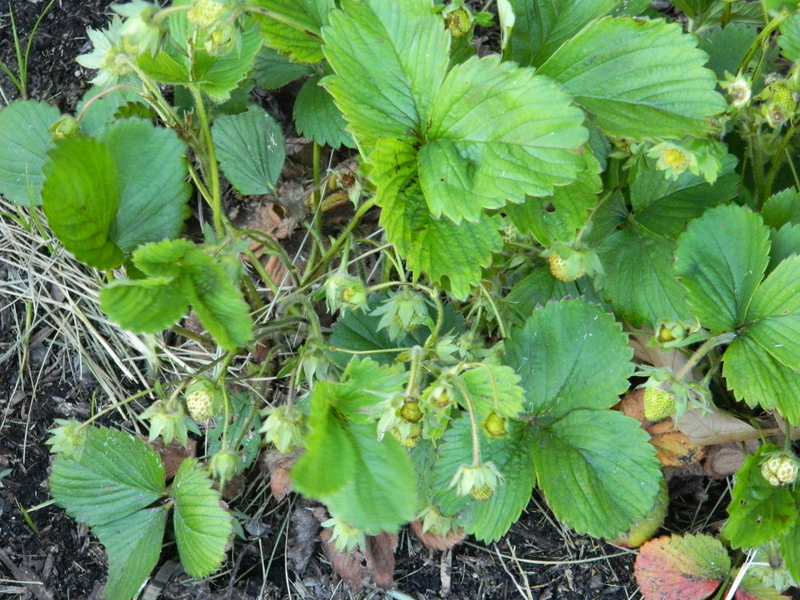 A quick little update on my strawberries… I went out to check on them and ended up harvesting about a pint or so! This is pretty cool considering that this is just the second year for the plants, when everyone has told me that it takes through the third season before you can expect a good harvest. I think I will harvest about half and let the other half fall on the ground to hopefully start additional plants. Get the patch filled in well. I also need to investigate about strawberry pests. 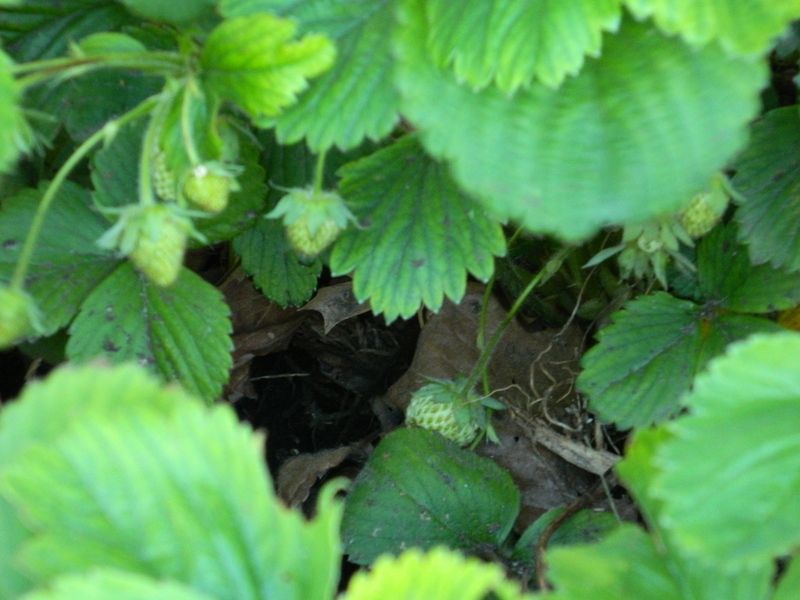 I noticed in one berry a tiny round hole. 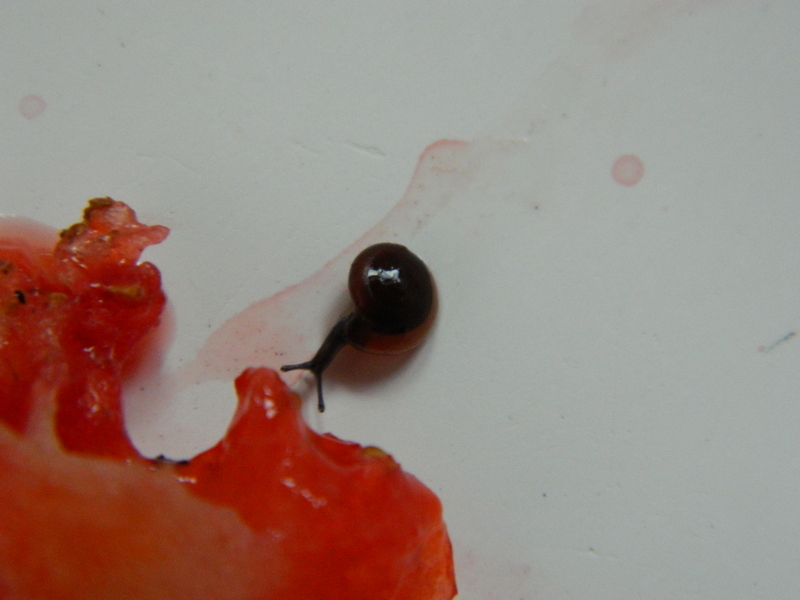 When I carefully dissected the fruit, it turned out that there were two very tiny snails were helping themselves to the fruit. I’ve never seen snails so small in my life. They were the only ones I seen in the patch, so maybe this is an anomaly. Like I said, the other berries were fine and I cleaned them and served them over shortbread and they were delicious! I am so excited about having my vines be fruitful. I’ll keep you posted about The Kid’s pumpkin patch. I have been considering cutting off much of my hair – again – and while making general comments about it, The Kid announced that he was fed up with the length of his hair. 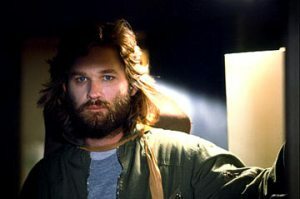 A few times over the last couple of years, he has attempted to grow his hair long. 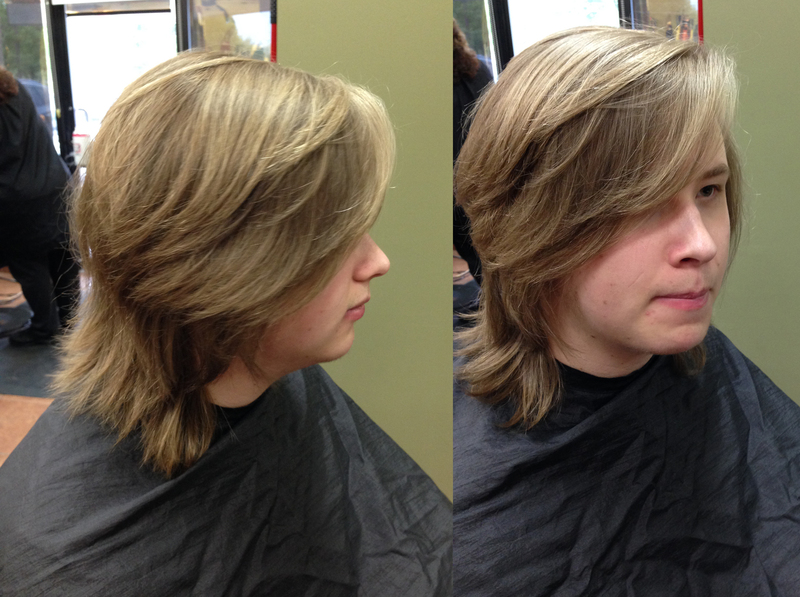 Long enough to donate to Locks of Love. He gets irritated with his hair when it gets to that in-between stage – you know, when the hair is starting to get long but not long enough for a pony tail. It just seems to get in your way and your eyes when you’re trying to drive or work. And it requires brushing and care that he really doesn’t care to do either. So, when I started talking about cutting my hair (mine is well below my waist) he announced that he, too, was ready to lose his locks. So, here he is in his ‘before’ photo. (At least his hair is clean!). I am fairly certain that if I didn’t color my hair, this is what color mine would be too. And his “after” shot. 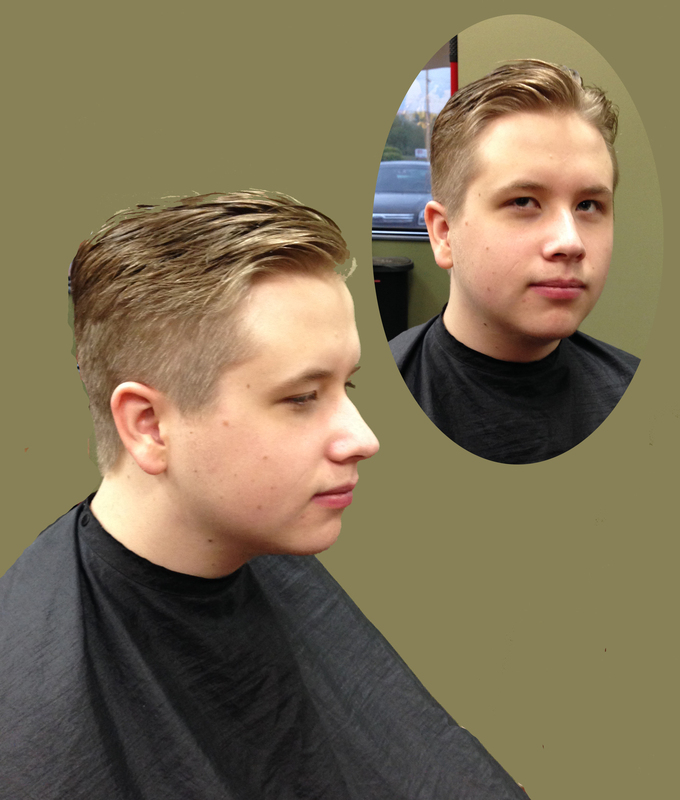 Over the years and many haircuts, I am always amazed that following a haircut, he always looks older. When he was a toddler and now and every one in between. I cannot believe that my “baby” turns 19 next month! I will be sure to post photos of my drastic cut that is scheduled for Thursday of this week. I have only two requirements: one, that it still be long enough for a pony tail (is is seriously aggravating to have my hair in my eyes while I am trying to work.. whatever I am doing) and two, that at least ten inches come off so that I can donated to Locks of Love. Although my hair is colored, the section that I will be donating hasn’t been colored for at least three years, so I think it is useable. This will be my third donation! Yes, my hair grows really fast. Stop back by to see the photos. I might even have the Kid do a video. Ha… I hope this isn’t too traumatic! 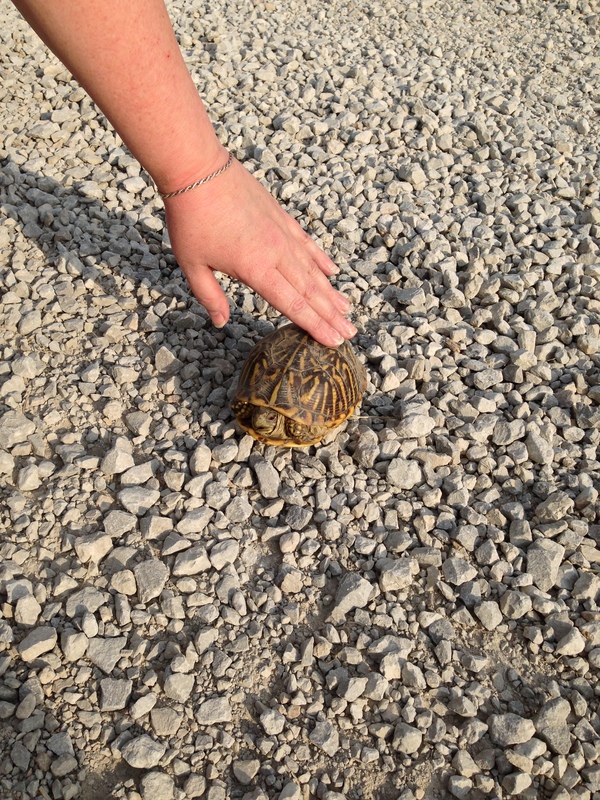 Of course we stopped the truck and assisted the little guy all the way across. 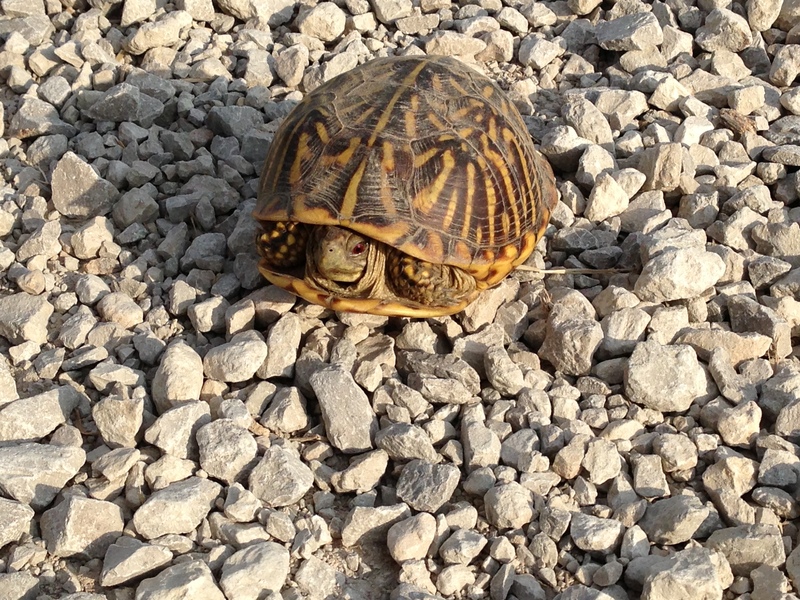 Its kind of amazing sometimes, living in cities and “civilization” we kind of grow unaccustomed to wildlife… almost any kind of life other than us humans. I seem to be a bit stuck these days. I gave some thought of “retiring” from the IT world and try my hand at something a bit more “creative”. The other day, the Kid and I were out and about and we saw the IKEA being constructed in Merriman. When we were in California, we used to go to the IKEA store all the time and did many projects using IKEA stuff as the starting point. Even the Kid’s built-in bunk bed system (I have GOT to find pictures of that) was started with two tall IKEA pantry cabinets. So, I thought, why not? When I got home I applied online for the new store. At worst, I thought, I had 30 or so years of steady employment and I wrote a little song and dance and provided my creative website to give them an idea of what I could do and applied for the position of Store Interior Design and Visual Merchandising Co-worker. Now I don’t really know what that long string of words mean, but I assumed that it had to do with setting up the diaromas that they have all over the store showcasing merchandise. I am really good at that (I think so anyway) and thought it might be a less taxing environment than IT. Well, much to my disappointment, I received the email two days back that said “thanks, but no thanks”. I don’t know why, really, that it bothered me. I suppose some of that invincibility that I’ve always had is getting worn out. On the other hand, I spent most of the day on telephone calls with a head-hunting firm out east that loves me (on paper anyway). We’re talking possibility of consulting back to Silicon Valley. My inside joke is that I would give my right leg to be back working in the bay area (I can’t give my right hand… I need it to do testing). Ha. 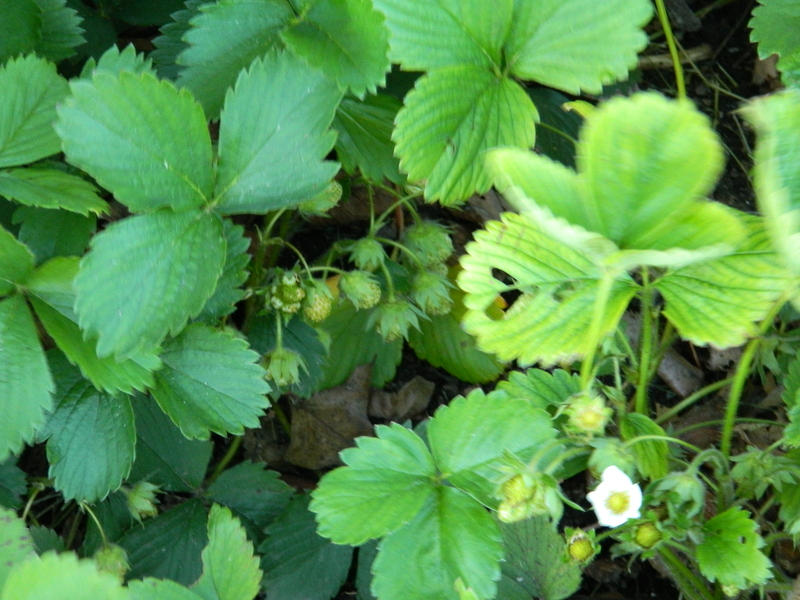 On a lighter side, the strawberries I planted last year have spread like wildfire. 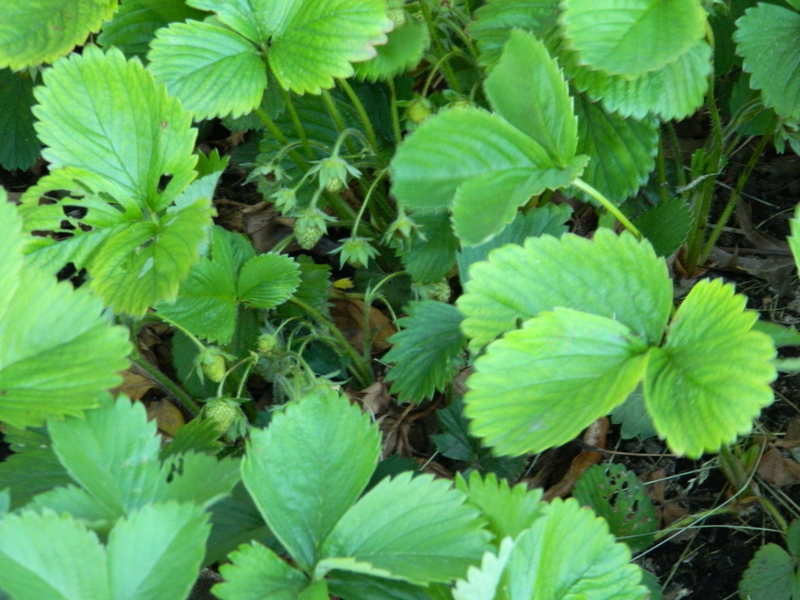 A few weeks back, the patch was covered in little white flowers which have been replaced with strawberries! So, I am closing tonight on a positive point. Argh! I have become, once again, inundated with spam! 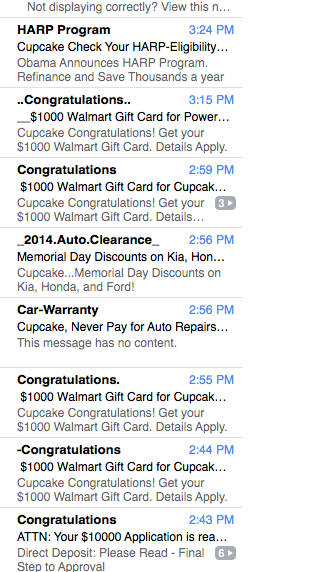 Every now and then, my mailbox loads up with offers for loans, car sales, weight loss supplements and “free” money. I have a couple of theories as to why this occurs, as I am unable to validate any of them. Let me just say that I think someone I once knew must have some extra time on his (or her) hands. Does SPAM ever work? I mean, how many newbies are there out there in the world? Once you’ve sent SPAM to every single person who ever had an email account, then what? Do they ever manage to snag anyone for any reasonable amount of money. I mean, profit? There has to be some overhead, right? I suppose if you manage to snag just one unsuspecting newbie, you might get a few bucks… but enough to make it prosperous and continue the ridiculous spamming over and over? I guess it can be easy to get someone’s email address into the spam-o’rama ridiculousness though. On a bet, I proved that you couldn’t get through one of those “giveaways” that promised you a new computer or iPad or vacation or something equally coveted. You start out with an easy quiz or task and it takes you down a rabbit hole from which you can never recover. Actually more like multiple rabbit holes all going in different directions all at the same time. And in the process your email address (and any other pertinent information) gets appropriated and disseminated to various spam sites who give or sell your information over and over to even more spam sites. I suppose if one were vindictive horrendous sub-human kind of person, that would be easiest way to inundate a potential enemy with SPAM! So, if you are reading this (and you know who you are!!) please stop. If you really miss me, call. I might talk to you. But not if you continue to fill up my in-box with this crap. One thing I wanted to start doing again, is using drop caps in my posts. If you are new to my blog, you won’t know that I have written over 300 posts, but once the original blogging turned negative and bitchy, I took a long hard look at what I had been writing and who I was lashing out at and decided that it wasn’t the best use of my writing. So, I drew a hard line and made all of those posts private. But one result of that action is that all of my use drop caps were hidden. So, I will start again. I found this wonderful site and an extremely talented designer who has posted much of her work for all to use. As long as proper credit is given, and this extremely talented woman deserves that and so much more. Her name is Jessica Hische and her website (at least the one I use) is called Daily Drop Cap. I am going back to using one per post, which means that I will be using them again, but I think they are worth it… they are GORGEOUS! And they are fun to use. o, I will use it in my closing today, since I am already at the bottom. Life sometimes seems to move at the speed of light and other times, seems to be a snail’s pace. And oddly enough, it seems that those two speeds can occur within the same day. Sitting on the area above the sink is an ‘inherited’ African violet that was bequeathed to me by someone leaving a job and I, of course, adopted it because for some reason, I can’t seem to kill a houseplant although I have never been any good at what I call ‘soft stem’ plants like violets. I re-potted it and apparently that was all it needed to start producing flowers again. Doesn’t hurt that being by the sink, I am reminded to give it lots of little drinks. Usually, I drown these plants. 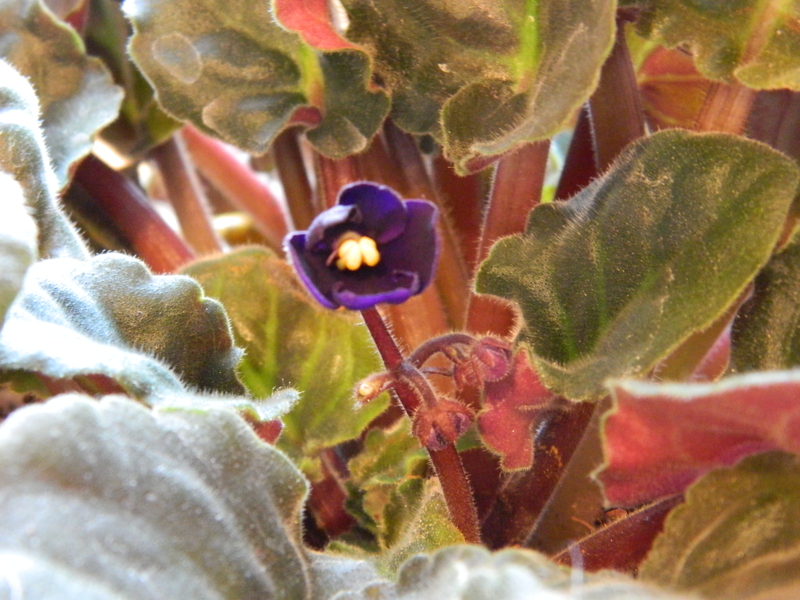 But I was ever so surprised to find this little purple flower. I’ve been doing some more thinking about this next stage of my life. I think I haven’t put the energy into job hunting because maybe I don’t want to do that anymore. QA and IT has been an essential part of my life and have allowed me to do everything that I have wanted to up to this point. I’ve made a good – no great living, both financially and emotionally. I’ve worked on the same level as most men (and above some as well) and I have worked with some really amazing people and worked for some amazing companies. I have had experiences that were off the charts, been to some really amazing places. It has been, as a whole, a splendid ride indeed. Which makes it all the harder with this new chapter of my life. I guess that is why I keep pontificating about what is supposed to come next. Spend entirely too much effort worrying about whether I can make the next phase of my life as good as the previous. Have I mentioned where I put in an application? IKEA. Yeah, crazy huh? They are building a new store in the area and I checked out their website and they had so many openings. But there was one that caught my eye: Visual Merchandising Coordinator. I don’t know why, when I saw that, I envisioned the creativity and fun that such a job could afford. I don’t have any real retail experience, but I told them about my website and all of the creative things that I do that could work for them. I am just a little nervous about hearing from them… in fact, I am a little nervous about not hearing from them too! I think that’s enough thinking for one day. I am wiped out from the physical labor of sanding the metal cabinet for the antique sink and painting and cleaning up. I am just beat. When I used to live in California, I used to take my son out to the beach on the Pacific Ocean. We had one that we called our own, and would go about once a month. On other occasions when I needed a bigger shift in attitude, we used to go to this wonderful place in the Sierra Madres mountains. See, for me, it used to be that I needed something larger to retrain my thoughts. To make me understand that in the grand scheme of things, my problems were seriously insignificant. Between the beach and the mountains, it was usually enough to help me make a mental shift and continue on. The problem really has been since we’ve move to Kansas City. Land locked and flat as a pancake. I have yet to find that magic place that allows me to be right with the universe. Until last night. About 3:00am, The Kid woke me by knocking on the bedroom door. We had talked about this a couple of nights earlier, that there was going to be a ‘meteor shower’ – 2014 Eta Aquarid meteor shower is expected to peak overnight from May 5 to 6. It is one showers that occurs every year as Earth passes through debris left behind by Halley’s Comet. Best viewing was supposed to be between 3:00 and 5:00am. Well, at the last minute, he decided he wanted to go watch. Well, we had to get out of town (away from the light pollution) and about 15 minutes or so, we were parked in the short space in front of a farmer’s field entrance and hanging out at the front of the truck. There is something very awe inspiring about watching the night sky and thinking about all of those stars and planets and solar systems. Makes you think about how just little impact a single person makes in the grand scheme of things. It allowed me to make my mental shift. At least for a little while. Blah. Bah humbug. Grrr. Sigh. Definitely not a lover of birthdays. Well, not at least my own. I don’t recognize the person in the mirror staring back at me. I’ve not become my mother; not even a female version of my dad. Sometimes I think I look like my maternal grandmother Bertha… God love the woman. She was the only person in three generations that I was taller than. By about a half inch. Tough old lady, loved her like crazy. So, where was I? Oh yeah… today marks another year gone. I don’t worry about death… rather I worry about being bored to death. Ha. I’m still trying to figure out what to do in this stage of my life. I would still consider Europe, but it would have to be soon or my health isn’t gonna get me there and back. Knees are just about gone. And the more time I spend babying my knees, the less exercise to get and the heavier I get. Damned cycle of degeneration. Weird thing about my career too. I am at a point of diminishing return. I mean, I have the skills and experience to do just about anything (and everything) but I’ve garnered a pay scale that most companies do not want to pay. I mean, what’s the difference between someone with 25 years of experience and someone with 10? And considering that computer technology changes so often and so drastically, that some of the technology I’ve worked with isn’t even around any more. So, how is that experience applicable? Although, I will let you in on a little secret… one of the skills and experience I have is with AS400 (that’s mainframe computing for the less technology experienced). And some companies – usually one that requires lots of computing power (like insurance or banking) – still use it. But God help me, that technology is so frustrating and aggravating that it hurts me physically. I really want to work on the new stuff, mobile platform stuff and the latest technologies. I just don’t seem to have an edge there. Actually, as of late, I am thinking I would like to do something else. If I could only hit on the right idea or business model and just work for myself. I love messing around with the furniture, but there isn’t really enough there to be a business. Besides, if I turned it into a business, I know I wouldn’t like it as much. If at all. It stands to reason for most things. One thing I thought about doing is long-arm quilting. Not only for others, but hell, for me too. I cleaned out the attic storage for the yard sale last weekend and found two large bins. These weren’t any ordinary bins, but ones filled to the brim with quilt tops that need to be finished. And at the current rate of an average of fifty bucks apiece, I am looking at (at the very least) $5,000 to $6,000 and probably more like the $10,000 mark, which would more than pay for the price of the machine. And then I could actually start doing this as a service for other people. I still have to do some research to see if it is feasible as a business and if it would be something I would even like to do for the foreseeable future. I’ve even just thought about taking a run of the mill retail job. Like at Jo-Ann’s. It wouldn’t pay as much as I am used to, but I would have the pressures and expectations of a technology sector job. But perhaps, maybe the rewards wouldn’t either. Either way, I am going to have to do something soon. I almost say this as a joke, but I think I have watched (and re-watched) everything worth watching on television, iTunes, Netflix and the cable movie channels. I really need something a little more structured in my life. But speaking of watching television, I am still investigating the possibility of being a closed caption transcriptionist. You know, one of those people who write the on-screen dialog for movies and television. This has a real potential, I think, as I could do this from home and maybe even do it on my own schedule. And so ends another uneventful birthday. And tomorrow promises to be just like today.